God, I feel old…and I had been feeling like such a young’en just a few weeks ago when I attended a fascinating dinner event put on by the Northern California chapter of the Explorers Club. The Club’s members include leaders (usually very well-published) in polar exploration, diving, aerospace exploration, archaeology, zoology, physics, oceanography, astronomy, ecology, geology, paleontology, conservation mountaineering, and speleology. Not surprisingly, these well-traveled scientific explorers are not what one would call a youthful bunch. As a matter of fact, I think I was the second youngest person there. The youngest person, at least 25 years my junior, was Colby Gewalt, a darling college student who was finishing up her MBA after getting a degree in architecture. She was filling in for her parents who couldn’t make the event. She then peppered me with questions about who, what, where and how could she get started. I told her that I was going to check out Trademark, a new restaurant on Belden Lane. I invited her to come along and write a review and if it was any good, I’d publish it here. Well she would, and she did, and I think she did a great job. Oh, the reason I’m feeling so old was that after spending two hours chitchatting over dinner, feeling like we were getting to be great buds, she wrote me a lovely thank -you card (even sent it by snail-mail) which started it with “Dear Ms. Nieder”. Growing up in Louisiana has its perks — you get to know what tickles the taste buds, and what doesn’t. Well, I’d have to say that the Trademark American Grill and Bar in San Francisco brings it all back for me. From the moment I turned onto the quaint alley of Belden Place, I knew I was in for a treat. Looking past the open outdoor dining area, complete with overhead heaters, passers-by are drawn in by the oversized window on the façade, with views of happy hour socialites and friends sitting at the pristine bar. With bowls of brightly colored citrus fruits against old-fashioned light fixtures illuminating the bar-top, one can hardly resist becoming part of the crowd. First piece of advice- come hungry. There are so many items on the menu to excite your palate, you’ll want to try them all. As you take your seat, place an order for their special light and flakey biscuits. Request honey on the side and these “Original Meetinghouse” biscuits will absolutely melt in your mouth. As you peruse the menu (which is updated monthly), order an appetizer, or three! Your choices include the meaty Dungeness crab cakes with a kick, or perfectly steamed mussels with a light and smoky broth. The beautifully presented tuna tartar and Caesar salad with balsamic onions are also fantastic choices. Go with friends or a date and share a few — you won’t be disappointed! Have a glass of Veuve Clicquot, or one of their specialty cocktails, and prepare to surrender your menu. If you are a bar-b-que meat lover, try the Niman Ranch pork ribs. As the meat literally falls off the bone, the tangy coleslaw and flavorful black beans round out the plate nicely. As a southerner, I’m a big fan of cornbread, but this wedge didn’t top my charts. Stick to the biscuits you’ve already had and save a few carbohydrate points. Order the half smoked chicken, and savor the juicy bursts of flavor. Served with surprisingly delightful garlic bread pudding and perfectly cooked collard greens, this dish takes you right into the heart of the French Quarter. While you may think you couldn’t possibly have another bite of anything, take a glimpse at the dessert menu. The hot apple crisp is perfection, but request it with the caramel balsamic gelato instead of the cinnamon. You’ve earned a sweet and tangy end to your night of indulgence. If you’re like me and save room for dessert no matter what, order the banana bread pudding as well. This not-so-typical version is served with butter pecan gelato, and takes you right back to your childhood. With a menu as diverse as it is indulgent, no one leaves here hungry. After all, great food like this should not be taken for granted, and you deserve it! When to go: Happy Hour from 2:30 to 6, Monday thru Friday. Oysters are $1 each, appetizer and drink specials as well. Lunch is served 11 to 2:30 Monday thru Friday. Dinner is offered 5 to 10 Monday thru Thursday, and until 10:30 on Friday and Saturday nights. Dress: Business casual, but all are welcome. Atmosphere: Inviting, fantastic use of color and texture, and the lighting was complementary, not glaring. Large mirror behind the bar, useful for slyly scoping out the crowd. Cozy bar area, right among the dining tables. P.S. Janice here. 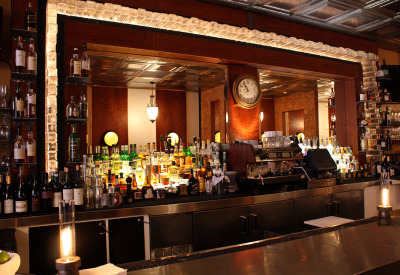 My two -cents worth: Just want to emphasize that theirs is one of the best Happy Hour’s around…with those $1.00 oysters, various drink specials and a roster of tasty bar bites such as Elite Cafe Garlic Chicken Wings $5. Also, I want to give a shout out to Trademark’s manager, Chris, a true professional who exemplifies customer service. Tell them I said you deserve a big raise! Banana Bread Pudding?!? I have yet to find a better bread pudding than the Santa Barbara J.K. Frimple’s served in the 90’s – it was too die for. Baked daily by a Vietnamese chef it was 4″ high, creamy yet firm, with just a few raisins and a crusty top. So game on. I am taking Trademark to the test!